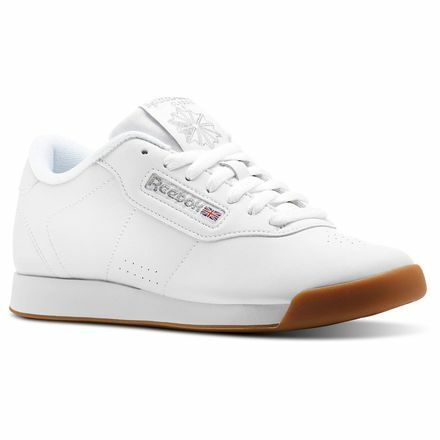 The Reebok Princess Women's Fitness Shoes in White / Gum; Cast your spell with one of the most comfortable shoes you'll ever wear. Synthetic leather upper means instant comfort. So does the soft terry lining. And count on plenty of cushioning from the EVA midsole and the padded foam sockliner. Synthetic leather upper for instant comfort. EVA midsole/lightweight cushioning. Soft terry lining/moisture absorption and comfort. Padded foam sockliner/comfort and cushioning. High abrasion rubber outsole for durability.